The odds are that if one of your employees was found to be sleeping in the office overnight, it would be pretty weird, right? So why should pests get to stay at the office overnight? Since they don’t pay rent; or do anything productive for that matter it might be time that you finally kick them to the curb. Pests are a nuisance, destroying property, biting employees and customers, carrying disease and creating an unsanitary work environment. 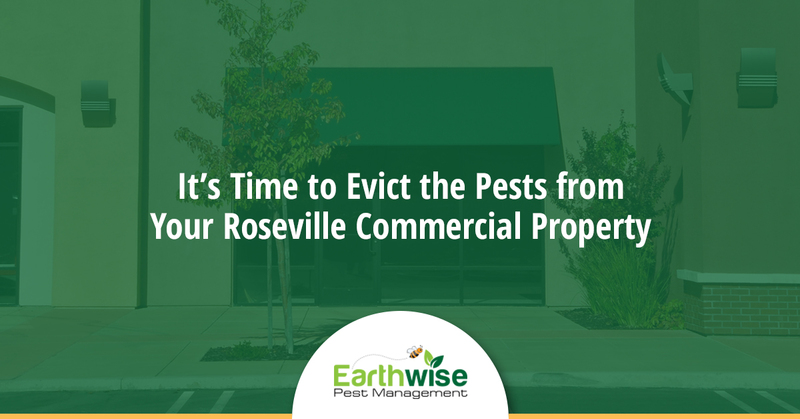 If you’re interested in cleaning up your commercial property and fostering a clean work environment that represents your company’s worth, you should consider calling us at Earthwise Pest Removal to talk about pest control management options and pest control prices. What pests should you be looking for? Here in the Roseville, we have a very diverse amount of pests to be aware of, so keep an eye out for these pesky critters! Rodents have historically been a problem in the area due to their ability to multiply extremely fast upon entering structures such as commercial properties. Cockroaches are drawn to food and damp places and are notorious for spreading disease. The Indian Meal Moth is driven to food where they live off of, and lay their eggs, in your food. Spiders can be found all across the Roseville area in both homes and commercial properties. Spiders also have the potential to be poisonous, although most are a harmless nuisance. A single bite from a tick has the potential to transmit Lyme disease. Ticks live in woods, and tall grass, where they latch on to passers-by. An insect that is seemingly always lingering around the entrance to your home or business is likely the mosquito. Mosquitoes can cause irritating itchy skin, as well as carry diseases such as the West Nile and Zika virus. Most ants are harmless besides the occasional large colony in a sidewalk, but carpenter ants are a different story. Carpenter ants burrow and lay eggs inside exposed wood on buildings. Stinging insects are a nuisance pest, often building nests in well-trafficked parts of town. Don’t let your business be the site of a stinging insect nest. Another stinging insect is the carpenter bee. As well as stinging, the carpenter bee burrows into exposed wooden structures, degrading the structure’s stability. Termites are small bugs that cause unprecedented amounts of damage to buildings. Termite control is important and must be implemented swiftly before the real damage is done. There truly are no shortage of pests here in the Roseville area. That being said, it is important to regularly inspect your business for signs of pest infestation. If you find pests, call us at Earthwise Pest Management, and we will make sure that it is the best pest control service that you have received. If you’re curious about our reputation in the Roseville area, take a look at what people are saying about us on our blog!